What Is The Cause Of Drooling? Home/News/What Is The Cause Of Drooling? Everyone drools every once in a while, mostly when we are asleep; but excessive drooling may be cause for concern. Drooling is excess saliva coming out of your mouth unintentionally. Drooling in your sleep is caused by the muscles in your face relaxing, which in turn causes your swallowing reflexes to relax as well. Drooling is actually pretty common, especially in sleep, but sometimes is can be a symptom of a more serious condition. Drooling can be a symptom of a neurological condition, sleep disorder, or another type of health concern. Here at South Charlotte Dentistry, we want to share some causes of drooling, what that may mean for your health, and how to treat it. Sleeping Position – This is the most common cause of drooling and it actually very simple. If you sleep on your side or your stomach, gravity will cause drool to pool outside your mouth and collect on your pillow. Especially if you are someone who breathes through the mouth when asleep. Blocked Sinuses – If your sinuses are blocked, either from a cold or other illness, you may find that nasal congestion leads to drooling more than usual. If you have regularly blocked sinus passages or a narrower than normal sinus, you may drool more often. These sinus conditions make you more likely to breathe through your mouth while sleeping which may cause more drool to flow outside your mouth. Gastrointestinal Reflex Disorder (GERD) – GERD is a condition that causes the contents of your stomach to flow backwards up into your esophagus, causing damage to your esophagus lining. People with GERD may have difficulty swallowing or feel like they have a lump in their throat. Sometimes, this leads to excessive drooling. Side Effects – Sometimes, drooling can be a side effect of medications. Antipsychotic drugs, some antibiotics, and medications to treat Alzheimer’s have be shown to cause more drooling than normal. Swallowing Disorder – The official medical term for a condition that cause difficulty swallowing is called Dysphagia. Dysphagia can be a warning sign for a more serious disease. Difficulty swallowing spit can be a sign of MS, Parkinson’s, muscular dystrophy, and some types of cancer. Neurological Disorders – Certain neurological disorders can affect the muscles in your face, making them weak and hard to control. If you are having a problem with excessive drooling, visit a doctor immediately. Sleep Apnea – Sleep apnea is a condition where during the night, your body will stop breathing. This is a serious condition and if you think you may suffer from it you should get a diagnosis. Drool can be a sign of sleep apnea but other symptoms include: loud snoring, waking up feeling startled or out of breath in the middle of the night, difficultly focusing during the day, drowsiness during the day, or dry mouth in the morning when waking up. These are some of the most common causes of excessive drooling. Drooling doesn’t always need to be treated. For example, drooling before the age of four is completely normal and not a cause for worry. Doctors generally only treat drooling if it is so severe that it interferes with your daily life and social interactions. There is also the risk that when your saliva glands produce too much saliva, you can inhale it into your lungs, which can lead to pneumonia. But what can you do to reduce the amount of drool you produce? Change Sleep Positions – If you are drooling simply because you sleep on your side or stomach, try sleeping on your back. Sleeping on your back will make it easier to control your saliva so it doesn’t end up covering your pillow every night. If you have trouble sleeping in a new position, it may be because it is harder to breathe in this position. Figure out what is comfortable for you. Drink Water – It may sound simple but drinking more water has numerous health benefits. If you are properly hydrated, your salivary glands will thin out the saliva you produce. Some at home remedies even suggest biting into a wedge of lemon. The citrus may thin out your saliva. Mandibular Device – A mandibular device is an oral device that goes in your mouth, like a mouth guard. This device can help you sleep better and help with drooling or snoring. If you think it would help you, talk to your doctor about these devices. CPAP Machine – Because drooling can be a sign of sleep apnea, it is recommended that you seek treatment as this may be the cause of your excessive drooling. A CPAP (continuous positive airways pressure) machine can help alieve some of these symptoms and stop your drooling problem. Surgery – Sometimes a doctor may recommend removing your saliva glands. This is generally only done when patients suffer from extreme neurological problems but another option is Botox injections. These injections help you from producing excess saliva but unfortunately is not permanent. Therapy – A doctor may recommend that you see a speech or occupational therapist. Therapy can help teach you how to position your mouth and improve posture control. Medication – Sometimes, a doctor can prescribe you a medication that can help reduce the production of saliva. There are many option to treat excessive drooling. Drooling could just be that: drooling. But it can also be a symptom of larger scale medical problems if you don’t catch it. If you are experiencing a problem with drooling, visit a doctor as soon as possible. Not having a drooling problem but it’s time for a checkup or a teeth whitening? 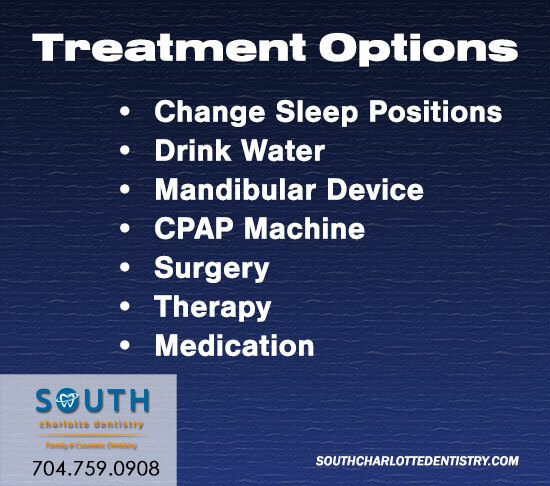 Give South Charlotte Dentistry a call or visit our website to schedule an appointment today!